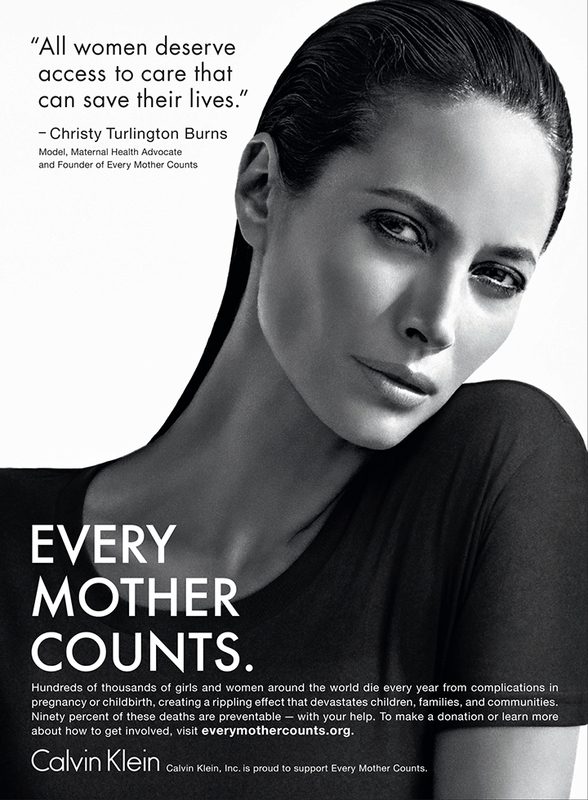 Calvin Klein, Inc. today announced a unique partnership with non-profit organization, Every Mother Counts (EMC), which was founded by model and global maternal health advocate, Christy Turlington Burns, who is currently featured in the Fall 2013 Calvin Klein Underwear global advertising campaign. The two organizations have come together to extend their existing relationships and create a multiplatform program designed to broaden awareness of EMC’s mission to make pregnancy and childbirth safe for all moms. The global multi-pronged initiative will be seen in print, outdoor, and online, as well as include fundraising opportunities to improve the health and well-being of girls and women worldwide through EMC supported programs in the U.S., Haiti, Uganda and Indonesia in their effort to avert deaths caused by pregnancy and childbirth around the world. ”I am thrilled to be representing the Calvin Klein brand again after so many years and especially proud of our partnership which will raise awareness and support of improved maternal health,” said Turlington Burns, founder of Every Mother Counts. Beginning with the November 2013 issues of some of the most read magazines in the world, a global EMC public service announcement (PSA) will debut featuring Turlington Burns, with messaging to broaden awareness of the organization’s mission and social media platforms, as well as direct people to learn more about, and donate to the cause. Created by CRK, Calvin Klein, Inc.’s in-house advertising agency, the PSA utilizes the creative from the latest Calvin Klein Underwear campaign which was shot by fashion photographer Mario Sorrenti. – During the month of October, messaging will be employed in the retail windows of hundreds of Calvin Klein Underwear’s freestanding stores worldwide. Additionally, to kick off the new association between Calvin Klein, Inc. and EMC, an intimate evening featuring a conversation between Turlington Burns and Glamour’s Editor-in-Chief Cindi Leive, will be hosted by Calvin Klein Underwear at the Macy’s Herald Square flagship store in New York City on Monday, October 7th. Held in Macy’s new Stella 34 Trattoria, the event will focus on Turlington Burns’ work as the founder of EMC and the important work they do. Guests who purchase a Calvin Klein Underwear bra at Macy’s between now and October 7th will be able to attend this special event. As previously announced, as part of the partnership Calvin Klein, Inc. has also signed on to become a sponsor of EMC’s running team for this year’s ING New York City Marathon, which will be held on Sunday, November 3rd. In addition to financially sponsoring the team, two Calvin Klein, Inc. associates will also be running with Turlington Burns and a team of 50 others on marathon Sunday. Additionally, Calvin Klein, Inc. has named Every Mother Counts its 2013 spotlight organization for the company’s annual holiday giving campaign, and will hold a fundraising event for associates to benefit EMC at the company’s New York City headquarters in November. Turlington Burns has a long-standing relationship with the house, beginning with her first runway show for Calvin Klein for the Fall 1987 season. In 1988, Irving Penn photographed Turlington Burns for her first Calvin Klein Collection advertising campaign. That same year, she became the face of Calvin Klein’s timeless scent, ETERNITY, for the fragrance’s launch campaign captured by Bruce Weber. Turlington Burns continued to work with legendary photographers, like Steven Meisel, Mario Testino, Peter Lindbergh and Jurgen Teller, for several more advertising campaigns for the Calvin Klein Collection, Calvin Klein Underwear, Calvin Klein Jeans, and Calvin Klein Swimwear brands, Contradiction fragrance, as well as three additional ETERNITY fragrance campaigns. While leading an illustrious career in modeling, Turlington Burns has gone on to direct and produce No Woman, No Cry – a documentary film about the global state of maternal health. Following the release of her film in 2010, she founded Every Mother Counts.